Cyber Monday is Coming!!! - Incredible Pizza Company - Enjoy our huge all-you-can-eat buffet, indoor Go-Kart Races, Bumper Cars, Route 66 Mini Golf, a huge video game arcade with prizes, Bowling, and more! The turkey has been eaten, and Christmas trees are starting to go up! What could be next??? The countdown to Cyber Monday, that’s what!!! One of our favorite days of the year at Conroe’s Incredible Pizza Company! Did you get out in the madness on Black Friday? Was it nuts? We thought so! That’s why we love Cyber Monday so much! All you have to do is go online and buy away! No lines! No rush! No parking space needed! Shoot, you can be sitting in your pajamas drinking coffee, and get so many gifts checked off of your list with this one sale! Can you think of anyone you know who doesn’t love food and fun??? We didn’t think so!!! 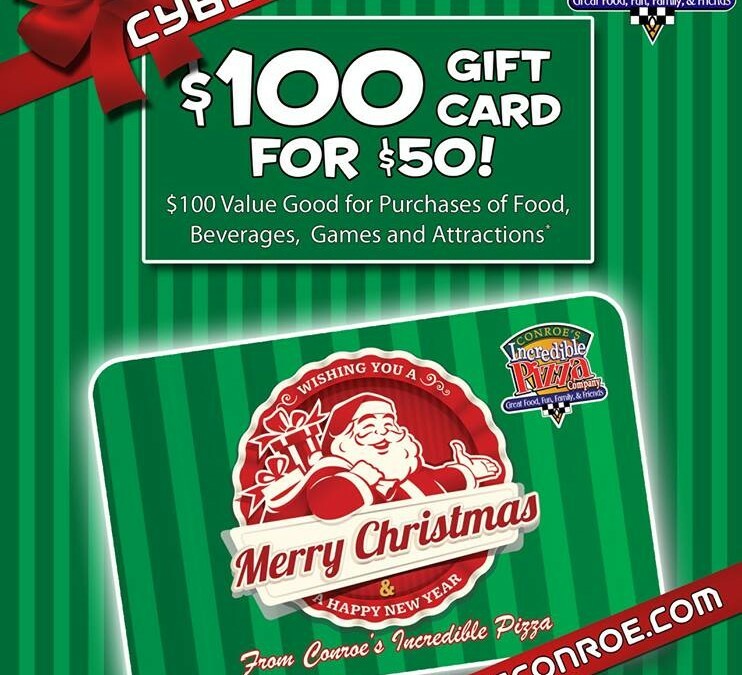 Our Cyber Monday special gives you a $100 Incredible Gift card for just $50! HALF PRICE! The cards can be used for food, games and attractions* at IPC in Conroe. And, there are no limits, so you can purchase as many as you’d like! We could go on! The gift cards are perfect for everyone! But, you gotta hurry! This Cyber Monday special is only available one day, and is online only! 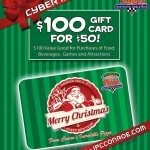 So, starting at 12 a.m., Mon., Nov. 26, click into www.ipcconroe.com/shop/to get your gift cards. Sale ends at 11:59 p.m. Monday night. We’ll get your order, process it and mail the gift cards to you immediately! We promise, you will be the Christmas hero this year! We can’t wait to see all of your friends and family coming through our doors with their favorite gift of the year! *Gift cards cannot be used for birthday party or event deposits.